OpenSSL is awesome! Though, requires little manual work to remember all the commands, executing them in a machine that has OpenSSL installed. In this post, I’m about to build an HTTP API over OpenSSL, with the most commonly used commands (and the possibility to extend it further – as required). This will help folks who wants to run OpenSSL in a private network but wants to orchestrate it in their automation workflows. Ever wanted to automate the TLS (also known as SSL) configuration process for your web application? You know, the sites that served via HTTPS and Chrome shows a green “secure” mark in address bar. Serving site over HTTP is insecure (even for static contents) and major browsers will mark those sites as not secure, Chrome already does that today. Serving contents via HTTPS involves buying a digital certificate (aka SSL/TLS certificate) from certificate authorities (CA). The process seemed complicated (sometimes expensive too) by many average site owners or developers. Let’s encrypt addressed this hardship and made it painless. It’s an open certificate authority that provides free TLS certificates in an automated and elegant way. However, free certificates might not be ideal for enterprise scenarios. Enterprise might have a requirement to buy certificate from a specific CA. In many cases, that process is manual and often complicated and slow. Typically, the workflow starts by generating a Certificate Signing request (also known as CSR) which requires generating asymmetric key pair (a public and private key pair). Which is then sent to CA to get a Digital Identity certificate. This doesn’t stop here. Once the certificate is provided by the CA, sometimes (Specially if you are in IIS, .net or Azure world) it’s needed to be converted to a PFX (Personal Information Exchange) file to deploy the certificate to the web server. PFX (aka PKCS #12) is a file format defines an archive file format for storing many cryptography objects as a single file. It’s used to bundle a private key with it’s X.509 certificate or bundling all the members of a chain of trust. This file may be encrypted and signed. The internal storage containers (aka SafeBags), may also be encrypted and signed. Generating CSR, converting a Digital Identity certificate to PFX format are often done manually. There are some online services that allows you generating CSRs – via an API or an UI. These are very useful and handy, but not the best fit for an enterprise. Because the private keys need to be shared with the online provider – to generate the CSR. Which leads people to use the vastly popular utility – OpenSSL in their local workstation – generating CSRs. In this article, this is exactly what I am trying to avoid. I wanted to have an API over OpenSSL – so that I can invoke it from my other automation workflow running in the Cloud. Next, we will see how we can expose the OpenSSL over HTTP API in a Docker container, so we can run the container in our private enterprise network and orchestrate this in our certificate automation workflows. We will write a .net core web app, exposing the OpenSSL command via web API. Web API requests will fork OpenSSL process with the command and will return the outcome as web API response. We are using System.Diagnostics.Process to lunch OpenSSL in our code. This is assuming we will have OpenSSL executable present in our path. Which we will ensure soon with Docker. This is simply kicking off OpenSSL executable with a command and capturing the output (or errors). We can now use this in our Web API controller. This snippet only shows one example, where we are receiving a CSR generation request and using the OpenSSL to generate, returning the CSR details (in a base64 encoded string format) as API response. Other commands are following the same model, so skipping them here. Above snippet assumes that we have OpenSSL installed in the machine and the executable’s path is registered in our system’s path. We will turn that assumption to a fact by installing OpenSSL in our Docker image. Here we are using aspnetcore:2.0 as our base image (which is a Linux distribution) and installing OpenSSL right after. Voila! We have our API’s. Here’s the Swagger UI for the web API. The complete code for this web app with Docker file can be found in this GitHub Repository. The Docker image is in Docker Hub. Lately I have written a .net core web job and wanted to publish it via CD (continuous deployment) from Visual Studio Online. Soon I figured, Azure Web Job SDK doesn’t support (yet) .net core. The work I expected will take 10 mins took about an hour. If you are also figuring out this, this blog post is what you are looking for. I will describe the steps and provide a PowerShell script that does the deployment via Kudu API. Kudu is the Source Control management for Azure app services, which has a Zip API that allows us to deploy zipped folder into an Azure app service. We will use dotnet publish command to publish our project. We will use System.IO.Compression.Filesystem assembly to create the zip file. 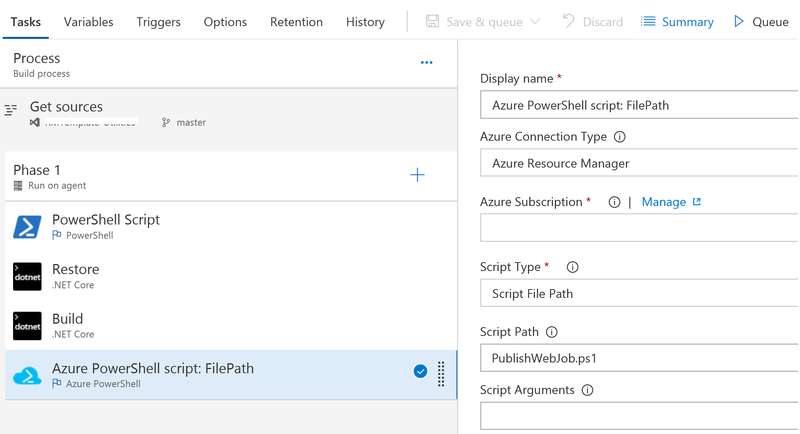 Now we can leverage the Azure PowerShell task in Visual Studio Release pipeline and invoke the script to deploy the web job. Thanks for reading, and have a nice day! Reverse Engineering Powered by WordPress.com.